Home reading had been promoted in the community since the Sunday School presidency’s 1870 creation of a library of books for children. That practice continued within the four LDS ward schools, which each had a small lending library for use by its students. The little town of Fairview, Saint Peter County [probably Sanpete County] which has only 960 inhabitants, has a public library and reading room. What’s wrong with Brigham’s 3,000 inhabitants* that they do not catch up in the procession of advancement with little Fairview? 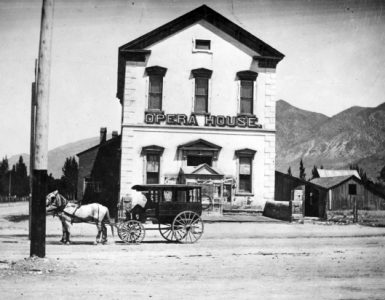 If the people of Brigham City really want a free reading room to help keep the boys off the streets nights and cultivate a taste for good literature, the Bugler has a proposition to make. Provided the city will furnish a suitable room with furniture, light, and fuel and a reliable man to look after it, the Bugler will see that the room is furnished with books, papers, magazines, etc. 1The Brigham Bugler, May 8, 1897, quoted by Afton Richards, Brigham City Library, Brigham City, UT, 1950, 1. While Snow’s editorial did not get a response from the city, it helped stimulate an idea that had been espoused by others in the community. The proposal caught the attention of LDS Church leaders. The first official action took place in the tithing office during a meeting of officers of the Young Men’s Mutual Improvement Association on October 8, 1897. YMMIA Stake President Oleen N. Stohl put forth the idea of establishing a public library and reading room as a united effort of the organization of the stake board and officers of the four Brigham City LDS wards. The plan called for the contents of each small ward library to be united in a central location for use by the general public.2Forsgren, 200-201. Action began at once, with the Brigham City Council consulted regarding a site for the building. 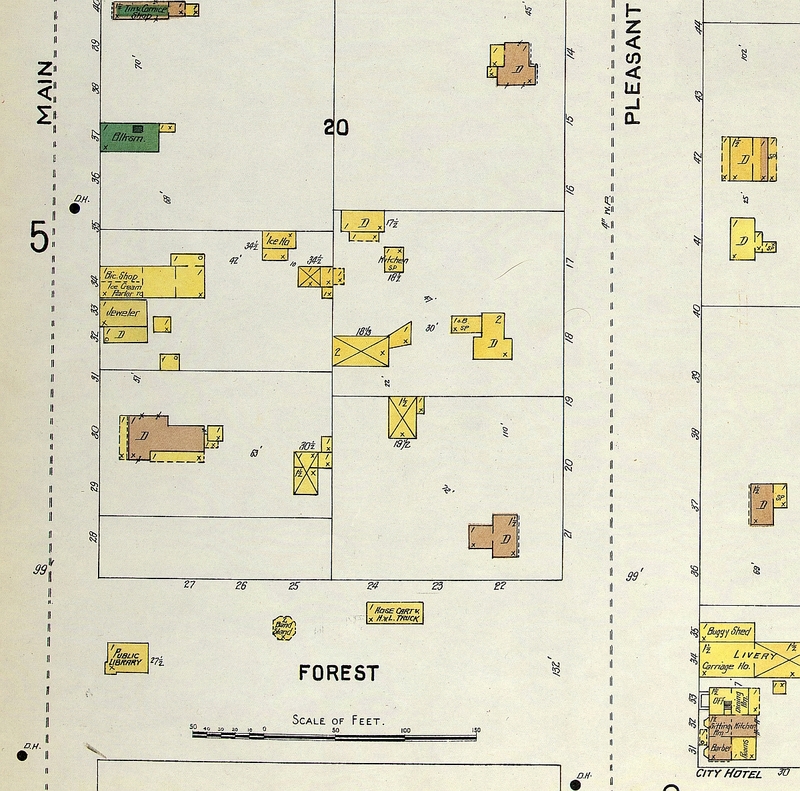 The northwest corner of the Court House Square was chosen (at that time Forest Street jogged north at Main Street around the public square, then jogged south at First East). Building committee: Oleen N. Stohl, John H. Forsgren, Isaac H. Jensen, George W. Watkins, and C. M. Squires; Finance committee: Fred J. Holten, Oleen N. Stohl, John H. Horsley, Maria Forsgren and C. M.Squires; Committee on Rules and Regulations: Nephi Anderosn, Rachel M. Evans, Sophy Valentine, Clemmence E. Horsley and Birdie Snow; Architect: C. M. Squires. Minnie L. Snow was appointed to assist the architect by corresponding with a Mr. Smith of Ogden concerning plans. David P. Burt was appointed chairman of amusement and concert committee for raising funds to maintain the library.3Forsgren, 201. Donated labor was used to construct the building, with some materials donated by lumber companies and other supplies purchased with the $650 to $700 raised by entertainments and donated by Brigham City residents. Funds were also needed to hire a librarian, purchase additional books, and cover building maintenance. Wards held dances, bazaars, and dinners to help raise money. The total cost of the building and furniture was $1,000 to $1,100. As the building was completed and approximately 425 books installed, the original committee was dissolved and a Library Organization was formed. The Executive Committee was comprised of YMMIA President Oleen N. Stohl and YLMIA President Minnie L. Snow. John H. Forsgren, and the eight Mutual presidents from the four wards as directors. John Baird was appointed librarian at a salary of one dollar per week.4Forsgren, 201. 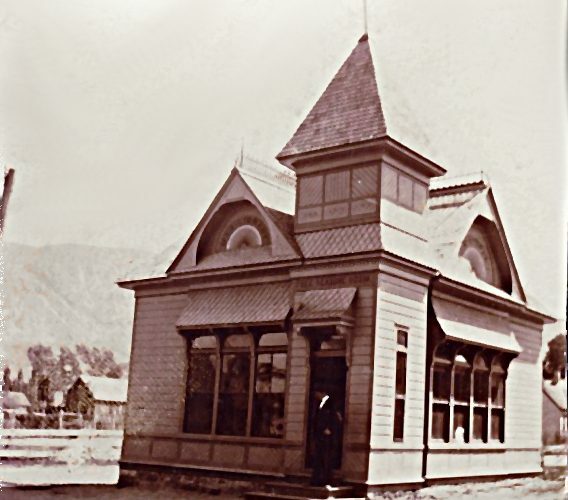 The MIA Library and Free Reading Room was officially dedicated on February 17, 1898, in a service attended by LDS President Lorenzo Snow, Box Elder Stake President Rudger Clawson, Box Elder Stake Presidency and High Council members, Brigham City Mayor J. F. Erdmann and city officials, and stake and ward YMMIA and YLMIA officers. 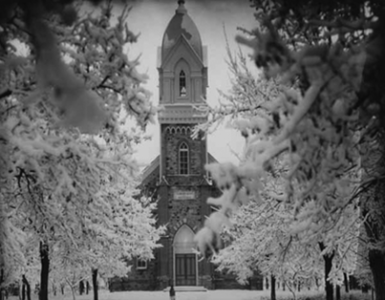 President Lorenzo Snow offered the dedicatory prayer, hymns were sung, and Patriarch William L. Watkins pronounced the benediction.5Forsgren, 202. The library was a one-story frame structure, with two entrances, one on the northeast side and one on the west side facing Main Street. Rather than being plastered, its walls were lined with cloth and then covered with wallpaper. The interior consisted of one room, with bookshelves along the north wall at first, and then gradually enlarged to cover the east wall. The telephone company placed the town telephone in one corner of the building, and a stove was placed in the center of the room. The Librarian’s desk was not stationary, but could be moved as desired. There were also a few chairs and tan tables for use by patrons.6Afton Richards, p 3, description of building from an interview with Wilford Freeman on Nov. 21, 1936. Although over 400 books had been collected, not all of them were suitable for the library due to condition, content, or duplication. They gave a good impression of a well-stocked library but were gradually culled to about 300 by Baird and board members. John E. Baird’s appointment to serve as the librarian was based on an agreement with the Rocky Mountain Bell Telephone Company. He would also serve as the company’s toll agent. Baird’s salary of one dollar per week was paid by the telephone company, in return for the privilege of placing the telephone in the library. When Baird was called to serve an LDS mission in 1899, his sister, Rena Baird (Hopkins), took over the same co-position. There was a not a fixed yearly budget for the library. Expenses were low, with $200 a year the maximum expense account. This covered the librarian’s salary (after the telephone was moved), fuel, books, and other supplies. Funds were raised by concerts, theatrical entertainments, and donations. At one time, the city donated $20 to the library fund.7Richards, p 4, quoting Improvement Era, March 1909, volume 12, 401. The MIA Library continued to serve the community up through the turn of the century, with ownership ceded to the city in 1913. It was replaced by a Carnegie Library in 1915.